You’ve spent an entire year agonising about starting a blog, finding the blog name, choosing the right website host, picking the blogging platform and branding, now you need to learn about monetising a blog! When does the learning ever end? Isn’t there a simpler path to start making money for online success and digital nomading? Why can’t someone design a simpler way to get this done? The truth is if it was going to be so easy then everyone will be doing it. In fact, it would be just as easy as getting a job at McDonald’s. However, every blog is different from the other making their content unique. Each blog serves a different audience and has a writing style to suit its readers. For this reason, monetising a blog will cater to the needs and appetite of the community it serves. 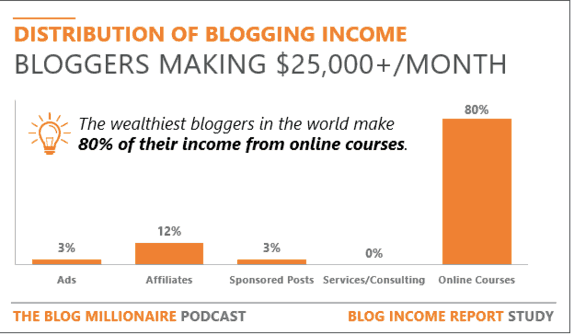 There isn’t a one size fits all when it comes to generating an income from blogging. You will need to test a few ways and settle down on the approach that is best suited to the niche, audience and objectives of the blog. Before we dive into ‘the how’ let’s spend some time exploring what is the definition of monetising a blog. It will be presumptuous of me to assume that you understand what I mean. In this wild, wild west that we call the Internet or online world there are several ways that entrepreneurs and businesses alike generate revenue. An online store like Amazon generates its income from selling products and services to consumers and businesses. While Google and Facebook earn revenues from selling ads. Other smaller retailers or boutiques sell clothes and gifts. Some even sell subscription boxes or subscriptions on membership sites. They are fortunate to build up an email list which is a big deal to making money online. The options appear to be endless for anyone in business. Bloggers can also earn revenue on their site if they decide to treat their blog like a business. Monetising a blog will involve using the content or blog posts of the blog to generate an income for the blog owner. The reasons a blogger will want to do that can be numerous. Let’s spend some time looking at why anyone will want to look at monetising a blog. If you have read my previous post about starting a new blog you will know that I encourage my readers to think long and hard about blogging because it is a long-term game. When I say long-term I mean 3-5 years or even 10 years. When you think about it creating content on a blog for that length of time does require a good bit of motivation. Depending on the stage of blogging the motivation will be different at each stage of the game. The first 6 months is often a very exciting time for a blogger. After a year the honeymoon period will wear off so there will be a need for something else to keep up the momentum. Of course, there will be a handful of people who can do two years without any return on investment. The cost of blogging can start off at a really low cost so a very low barrier to entry. However, the motivation needed to continue blogging every week or month will take a mental toll. At some point during the course of your blogging journey getting paid to create content will cross your mind. For some, this will happen at the start while others will be later on. Some bloggers will happily write content every week or month to keep their readers happy or entertained. One of the key benefits of blogging is to build a community using email marketing. Having a following of like-minded people who can relate to your topic or cause is awe-inspiring and noble. However, is it sufficient to motivate a blogger for the long-term? Bear in mind that the more readers or visitors to your site means an increase in overhead cost. Week after week of creating content that includes images and video can slow down your blog. You will eventually move to a faster hosting plan that can handle all these readers. You will also need to maintain a great user experience to keep the readers coming back for more. In the initial stages when no one knows about your blog you spend a lot of time getting the word out. After a while to stay competitive you may need to invest in courses or hire a VA.
All these costs will add up over time and soon your blogging bill can reach in the 100’s of dollars every month. Your blog may be your baby but someone needs to pay the bills. It is therefore important to have a ‘monetising a blog’ plan so that your blog can generate some income to meet those blog expenses. After about two years of blogging it is safe to say that you would have built some authority in your niche. The journey to building niche authority is not an easy one. It will be a big disappointment if you need to wrap things up as a blogger due to a lack of funding. Of course, these things can and do happen due to personal circumstances. However, avoiding the abrupt end to a blogging career is a good reason why monetising a blog is a wonderful idea. It is a great form of passive income where the blog becomes self-funded. When a blog has authority in the niche it is also the go-to place for factual information. It is also a great place to learn from another person’s experience. The blog post combined with the list of associated comments also brings a deep sense of community in any niche. Can you imagine what the world would be like with only a bunch of corporate sites? The world would be fairly boring without bloggers. We need bloggers to keep things real and to learn from one another. Another reason why you will want to monetise your blog is that it offers a world of financial independence. Imagine becoming a digital nomad where you are a location independent entrepreneur. It is such an awesome feeling when you don’t have to work a 9 to 5 job. No need to request time off from anyone because you decide your own hours. As a digital nomad, you can decide to travel the world while blogging. You can work from virtually anywhere you want as long as you have access to the Internet. You may be thinking that it all sounds good but that is not possible for you. If you believe that you are not good enough to be a digital nomad then hold that thought. Your dream can become a reality with a bit of planning and strategy. It is true that monetising a blog does not happen overnight but the fact is that it can be done. The services/consulting method means that you are still using the blog as a platform to advertise your services to potential clients. If you never heard of affiliate marketing before that is okay. It basically means that you advertise other people’s product or service on your website and when someone makes a purchase you get paid a commission. There are a great number of affiliate programs available from the normal to the obscure. I mentioned Amazon previously and they have an affiliate program where you can earn a commission. As you are aware Amazon sells all kinds of products and services and I would be surprised if you cannot find something that you can promote. The secret to generating a full-time income from affiliate marketing is to focus on high paying affiliate programs as much as possible. Because it takes the same amount of time and energy to promote a high paying affiliate program as it does to promote one that pays you 10 cent for each sale. Also, if you can find a handful recurring commission affiliate programs it will make your ability to generate a monthly income easier as part of it becomes passive. Running ads is another great way to generate an income from blogging. 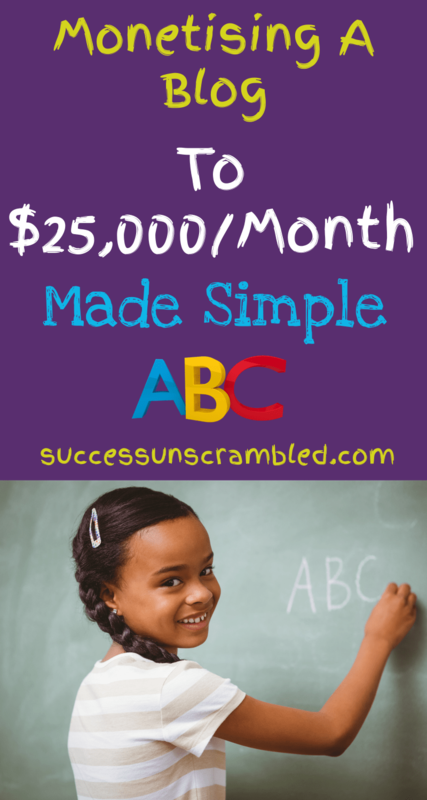 The easiest way to start is by getting approved for Google Adsense. Once you have a significant amount of visitors to your site resulting in pageviews then it will be worthwhile. When I say a significant amount of traffic I am talking about a minimum of 10,000 page views a month. The popular ad networks to join include Adsense, AdThrive, MediaVine and a few others. The only downside to this is that you generally do not get to pick and choose which ads are shown and which ones should be excluded. Another point to note is that there is a traffic ceiling whereby bloggers don’t make much more money from ad networks and that ceiling is 100,000 visitors per month. If for some reason you don’t get accepted for Adsense you can take a look at these Adsense alternatives to see which will suit your blog. As the name suggests bloggers can generate an income by selling their own products to their website visitors. These products can range from physical products like planners and calendars to online courses and everything in-between. While these may not seem like they fall into the ‘make money blogging’ category we need to remember the purpose of a blog. The blog is there to educate and help solve problems for the visitor so be mindful what you blog about to them. Technically selling an online course that helps solve a problem can fall into the category of ‘make money blogging. The same thinking process applies to physical products. A blogger builds their authority in that niche as well as build a brand and a community. That community would like to feel like they belong to something bigger so the blogger can sell T-shirts, pens and mugs. Sponsored content is a valid way to generate an income from your blog. 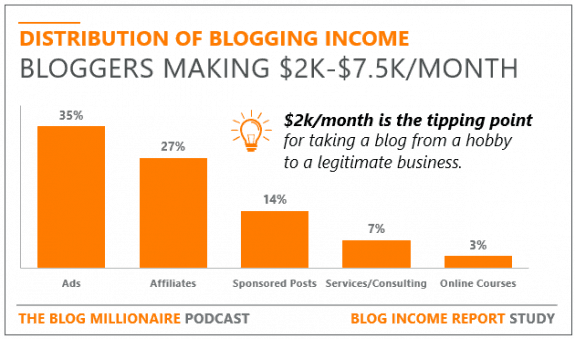 It essentially means that a blogger is paid to write posts as opposed to blogging for free. The sponsored posts tend to be a review of a product or service that a brand is willing to pay for in return for getting eyeballs on the review. There are several terms and conditions around sponsored content so it is important to check the fine details. Breaking the rules can mean bad news for the ranking of that post. While you may not be able to make a full-time income from sponsored content over the long term it is a great way to generate an income to pay the blogging bills. A great way for beginners to mid-range bloggers to generate an income online is by offering their services or running a consulting business. This list is not exhaustive but it can give you an idea as to what is possible in terms of generating revenue online. It is very helpful while on that journey to earn a full-time income from blogging. As a blogger, you will have experience setting up a blog and generating organic traffic. This means that you now have experience doing those two things so you can offer the same service to others for a fee. Those in the lower income bracket generate their income from ads, affiliate marketing, sponsored posts, services and online courses. Here is a graph showing the general distribution of that income. As you can see bloggers in the $25,000 plus income bracket make 80% of their income via online courses with only 12% coming from affiliate marketing and 3% from ads. It is safe to say that it is possible for you to monetise your blog using the 5 popular categories mentioned. The obvious question is which one can you get started with right away. If you are still on the fence about starting a blog feel free to take my 10-day start a blog challenge to help you on your journey to becoming a professional blogger. However, if you have already started blogging but you are stuck when it comes to generating traffic to your blog then check out this brilliant course to start driving visitors to your blog this week. You may be a stay at home Mom and you want to get started in becoming a freelancer before you become a blogger and that is fine. You will love this course here for Mothers who want to become freelancers. Maybe you are already an entrepreneur and you need to outsource this whole blogging thing to someone so you are looking for a virtual assistant retainer package so that person can take it off your plate. You can hire me here. Do you still have questions? Feel free to post your comments below or contact me here. Do some keyword research using a good Keyword research tool like Keysearch and come up with a list of 100 possible blog post ideas. Find the perfect domain name based on the instructions from the ebook and purchase the domain name. Write your first 10 blog posts with each being 1500 to 2000 words in length ensuring that you follow the instructions on how to write high converting posts from the ebook. Purchase hosting from this great web host here. Start a blog based on this course here. Ensure that your posts is totally SEO optimised. You can check out this popular SEO tutorial here. If you have not done this already set up your Pinterest Business account and follow this great Pinterest course here. Remember to market your content on Pinterest and use TailwindApp lavishly. This is such a great and informative post! I really feel as though I have learnt a lot, and you shared some wonderful ideas. A great post for all bloggers to read. Thanks Alexandra, I’m so glad that you found it great and informative. These are really great tips and I am thinking of now doing some freelance work with my blog and hopefully all works well. Thank you for these suggestions, it’s really helpful for anyone starting out and planning to monetise. That’s awesome Joan, what areas of freelancing is your speciality? Maybe my readers can avail of your services. I think being able to make this much a month would be an absolute dream, I would be walking on cloud 9 if I was brining in around 25k a month! Amazing! Hi Sarah, it is totally possible for sure. 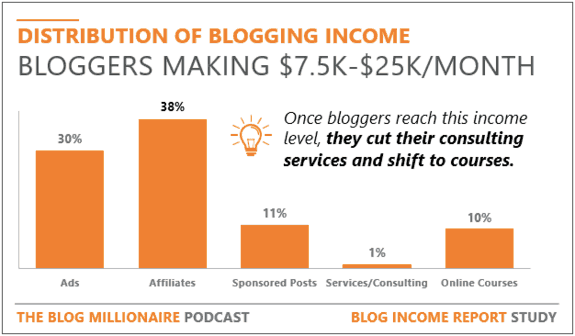 There are many bloggers that are earning these levels as you can see from the report. It does take a bit of planning and developing multiple streams of income. At least you know which streams to focus on the get to that goal. This post has to great tips as I’m trying to monetize my blog. Thanks for sharing! That’s great Kylie, it would be great if you can keep us posted on your results. These are great step by step on how to monetize your blog. Making $25,000 a month sounds fantastic. I should try to input these tips! Yes Soonjoo, it is fantastic and possible. You only need to implement those smart goals and achieve them. So many different ways to earn money from a website. I have started to do affiliates so I am hoping for more income. That’s awesome Tara, it would be great to join a group/tribe to compare notes. I will keep this in mind. I would love to earn more money from my blog and my goal is to increase my income. That’s awesome Amber, I would love to hear how you get on. how helpful is this! im still quite new to the blogging world so this is sincerely helpful to me! I’m so glad you found it helpful Patricia-Ann. This is an amazing blog post! Thank you for sharing your knowledge about these. Love it!! I’m so glad you liked it Gladys. Awesome Lindsay, keep that dream alive, set your goals and achieve them. Great post! Thanks so much for sharing these tips. I’m glad you like it Charli. This is really good and informative. You have created the article very well. Many, who want to monetise their blogs will be benefitted from it. Thanks for the kind compliment Monidipa. There’s lots of great information in this post! Monetizing can be hard especially when you don’t know where to start! I’m sure this will be helpful to a lot of people! That is true Liz, knowing where to start is super important. Thanks for your input. I would be over the moon to make so much money from my blog. At the moment I do monetise it but the amounts are always fluctuating month by month. I think good content and excellent SEO is at the base of every successful blog. Joanna, you are so right good content and excellent SEO are super important. Yes Fely, having a community of raving fans to grow with you always propels you forward. These are all really great tips! I have thought about doing some social media strategy work, but just have not branched out to that yet! Angela, Social Media Strategy is a great area to focus on as I see several ads where small businesses are looking for a Social Media Strategist. I do find it fascinating that the real money from bloggers comes to those who are willing to put together online courses. Part of me understands it because the market is out there. The other part of it makes me feel like the purpose of blogging is undercut somehow. People come to blogging because they believe they have a voice to talk about something. But now you are saying bloggers make the most money by talking about blogging. It makes sense. Just kind of sad I feel. Actually David, the vast majority of courses available are not about blogging as I know for a fact that many ‘start a blog’ courses are free. There are more specialist areas like ‘how to become a VA’, ‘Facebook Marketing’, ‘Instagram Ads’, ‘How to Become a Writer’, ‘Proofreading’, ‘Affiliate Marketing’ that are paid courses and are the ones that generate an income. I hope that makes sense. Excellent write-up Alvern. I really enjoyed you projecting the reality of what it will take to really begin to see monetization. I hope new and especially frustrated or disappointed bloggers find this post and calibrate/recalibrate themselves. Awesome Timothy, so glad you liked it and found it useful.